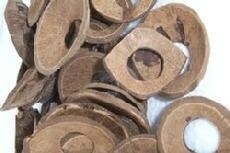 Order blank whole coconuts, hollow coconuts, coconut cups and half shell coconuts on this page. Unpainted coconut products are ready to be painted. Our hollow coconuts, coconut cups and half shells are natural products, free from any chemical treatments and are suitable for food and drink. Per USDA regulations, our whole size coconuts have been fumigated and are not suitable for consumption. To Paint: Prepare surface by sanding and cleaning if necessary. Allow to dry. Because of the ease of clean up and availability of a wide variety of products, we use acrylic based paint, acrylic clear top coat to seal and protect and finally permanent markers to add detail. You may use lacquer based if you like, just make sure that all products are the same type - either all acrylic or all lacquer. 5 unpainted coconut cups. Made from real coconuts and suitable for food or drink. Handwash only. 3 - 4 inches tall with same respective width. Holds 9 - 12 oz. Paint them if using for liquid, as this will waterproof the coconut shell. Use them for drinks, pen holders, trophies, making candles, making crafts and more. Allow 4 business days if you would like us to waterproof with our clear protective spray. 30 unpainted coconut cups. Made from real coconuts and suitable for food or drink. Handwash only. 3 - 4 inches tall with same respective width. Holds 9 - 12 oz. Allow 5 business days if you would like us to waterproof with our clear protective spray. If ordering more than one box email us for turnaround time. 30 unpainted Coconut half shells. The smoothness of the natural shell may vary. Made from real coconuts and suitable for food or drink. Hand wash only. 3.5 - 5 inches in length. Tropical Mailer with an unpainted Hollow Coconut and excelsior packing material. Feel free to send a paper scroll for us to insert. Otherwise, send us your file and we'll print color copies for $1 each. There are no quantity discounts on this item. Postage is included to US addresses.